I have been out of action for a little while as life has taken over. I have sold my house and have been busy house hunting so have not had a lot of time for card making. I have also been in training for a long distance walk I am due to undertake with three friends. The walk is The West Highland Way which takes us from Milngavie, just outside Glasgow, to Fort William. A distance of 93 miles in 7 days. We travel to Glasgow on the Friday 17th June and start our walk the following day. With this in mind I thought I would make a card for each of my fellow walkers to mark the occasion. Imagine my delight when I saw that Little Claire had brought out the most appropriate stamp - The Great Outdoors. 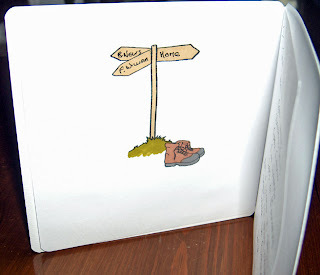 The card shows the route of the walk on the left - I downloaded this from a West Highland Way web site - I then stamped and coloured with pro markers the image, before matting and layering, then finishing off with some card candy. I then stamped the sign post image with the boots on the inside. I decided that the locations written on the post would show the way home, the way to our destination of our walk, Fort William, and also Ben Nevis as we climbed this 2 years ago. Great card and good luck with the walk!